“Sails to the northwest!” the lookout shouted. Commodore Perry ordered his battle flag raised. The words “DON’T GIVE UP THE SHIP” fluttered in the breeze. The British concentrated their cannons on Perry’s flagship. Within a short time the LAWRENCE was severely damaged. Perry then carried his battle flag over to the NIAGARA and sailed this smaller ship into the British battle line. Broadsides from the NIAGARA compelled the British to surrender. Immediately following his victory, Perry penned the famous words “We have met the enemy and they are ours…” Oliver Perry was only 28 years old at the time of his victory on Lake Erie. 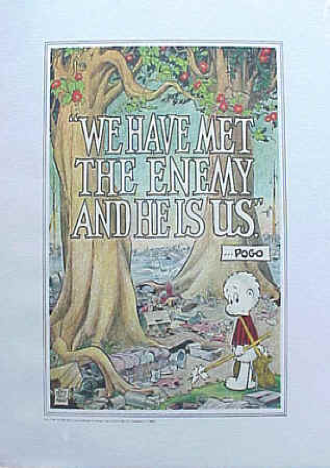 “We have met the enemy and he is us!” is the twisted version of Oliver Perry’s words and was used in the 1960s by Walt Kelly in the comic strip “Pogo.” At that time Pogo was one of the most famous comic strips in the newspapers. Walt Kelly explains on page 224 in his book “The Best of Pogo” the origins of the quote. “In the time of Joseph McCarthyism, I drew a character named Simple J. Malarkey in an attempt to explain each individual is wholly involved in the democratic process, work at it or no. The results of the process fall on the head of the public and he who is recalcitrant or procrastinates in raising his voice can blame no one but himself”. In the years that have passed, Kelly’s quote has been used by others to describe our battle against water and air pollution plus a myriad of other issues. “Vox populi vox Dei” is a Latin quotation when translated says: “The voice of the people is the voice of God”. Historians tell us the phrase first appeared in a letter written to the emperor Charlemagne in the eighth century. It implies that the majority opinion is always just. Political pollsters want you to believe this to be true. The news media also wants you to believe that when a presidential candidate is leading in the public polls, God is endorsing that person for president. On the contrary history tells us that the will of the people, at times, has been evil as manifested in Prewar Germany in the 1930s. The eighteenth century philosopher John Stuart Mill went as far as to say there can be tyranny in the voice of the majority.